I would say Lada is a badass female character, but Lada is bloody savage. She went back to the mountain in her mind, stood on its peak, remembered the way the sun had embraced her. She would never toss aside her country the way her father had. She would protect it. A small sob threatened to break free. What could she do? She had no power. Yet, she vowed. She had no power yet. Don’t expect Lada to apologize for what and who she is. Because for once while reading a book, I completely agree with everything that Lada is said to be. She’s a Dragon, she’s brutal, and she is so fierce. But trust me when I say that Lada isn’t the only one who’s character took me by surprise. This story also shows Radu (more well know in history as Radu the Handsome), Lada’s more gentler brother. He tucked himself into a corner of the stables, a dark, musty spot where only someone looking could find him. No one was ever looking for Radu. A spider crawled down his hand and he lifted it, gently placing the spider on a wood beam where it would be safe. The thing that was so amazing about this book was that Kiersten White showed how Radu had so many skills and talents that Lada didn’t have, simply because of their personalities and who they were. This is also probably one of the best sibling love-hate dynamic that I’ve ever read. I’m trying to think of words when I write about Lada and Radu’s relationship. 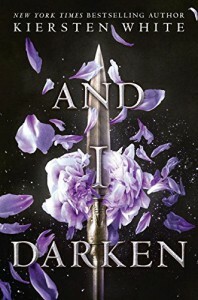 And I Darken explores sexuality, friendship, religion, gender bending, and sometimes, what it means to be a woman in a male dominated society. I already expected this book not to be too focused on Lada’s personal journey yet, because there was just so much ground to cover. But it’s still an amazing first book that is making me die for the second one! Also thank you, Kiersten White! Because even after all the things that happen to Lada, she is a consistent character! You go, girl, you burn everything to the ground.